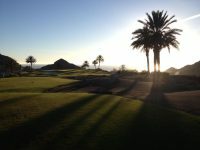 Anfi Tauro Golf is a golf resort situated in the valley of Tauro in the south of Gran Canaria, near Puerto Rico. It hosts luxury three-bedroom villas, a timeshare hotel and two golf courses, which were designed by Robert Von Hagge, the famous golf course architect of more than a thousand golf courses world wide and his partners Smolek and Bari. The Arizona-desert style golf course it is surrounded by beautiful villas, botanical gardens, ravines and mountains. When playing there you will have some fantastic views of the Atlantic Ocean. Arriving at this impressive golf course, you have to admire the landscape and the amount of work and engineering it took to make this course magnificent. It boasts one of the most expensive holes in Europe, as half a mountain was removed with explosives to build the 5 tiered green of hole 8. On the picture below you can see hole 6 of the Par 9 golf course, which is also the Anfi Tauro signature hole. And this is how it looked in 2000. The ridge of hole 6 is the top of the mountain above the gentleman in the white shirt. Then gentleman in the white shirt is Bjørn Lyng, the founder of Anfi. To his far right is Robert Von Hagge, the architect. 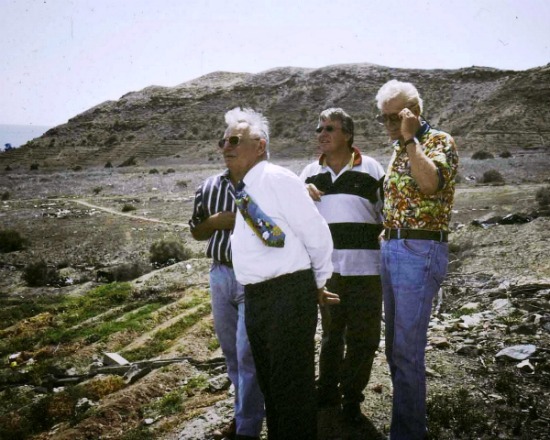 This is the only time Von Hagge was actually on Gran Canaria in person to get an impression of the project. You can read the interesting project history, opening in a new window when you click on the Anfi Tauro Golf Project, a blog from Van Hagge’s associate Richard A. Barril. There are two golf courses you can choose between, both equally impressive. On the Par 3, 9 hole chip and putt you can have a fast round of golf when you have only a couple of hours to play. The Championship Course is a spectacular golf course challenge. If you manage to play to your handicap you have played well. Official tournaments on the Anfi Tauro golf course are mainly held in the summer and are open to anyone with a Spanish or Canarian golf federation card. If you do not own one of these cards, the course may allow you to play, but you will not be eligible to claim a prize if you should win. There is also a friendly tournament every weekend organised by the course’s resident pro. This tournament is open for everyone and it is a Texas scramble 4 ball tournament. If you would like to enter this, you can put you name down on the list at the par 3 course/ driving range where the resident pro is based. The normal entry fee for this tournament is between 45 – 55 Euros which includes buggy and green fee. Plus 10 Euros extra towards the prize for the winning team.